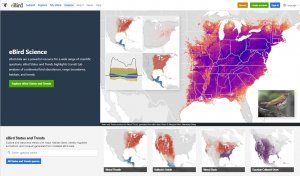 eBird Status and Trends provide an unparalleled window into the full annual cycle of bird populations in North America. Cornell Lab of Ornithology researchers have developed these novel statistical techniques to model eBird data across continents at fine spatiotemporal scales. Maps, charts and other products explore the range, abundance, habitat, and trends for 107 avian species. 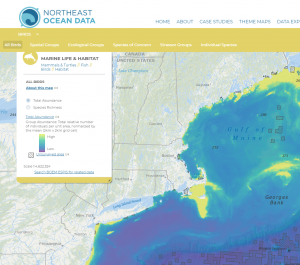 The Northeast Ocean Data Portal is a centralized, peer-reviewed source of data and interactive maps of the ocean ecosystem and ocean-related human activities in the northeastern United States. The maps on the Portal show the richness and diversity of the ecosystem and illustrate the many ways that humans and environmental resources interact. By providing user-friendly, centralized, and free access to data, information, and tools, the Portal facilitates decision making by a broad range of government agencies, industries, non-government organizations, academic entities, and individuals. Portal users can access data in a variety of ways: by theme, by making custom maps in the Data Explorer, or by directly downloading the data for personal use. 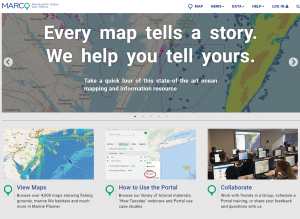 The Mid-Atlantic Ocean Data Portal is an online toolkit and resource center that consolidates available data and enables state, federal and local users to visualize and analyze ocean resources and human use information such as fishing grounds, recreational areas, shipping lanes, habitat areas, and energy sites, among others. This database provides global and regional conservation assessments of each bird species that, among other uses, can be used to objectively assign regional and continental conservation priorities among birds. Currently, Bird Conservancy of the Rockies maintains PIF species assessment data on all bird species in the U.S. Canada, and Mexico. This database aims to: (1) provide users access to the estimates of landbird populations published in the North American Landbird Conservation Plan (Rich et al. 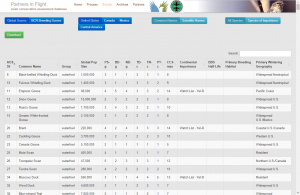 2004), which were based mainly on Breeding Bird Survey data from the 1990s: (2) allow users to view and download estimates for landbird populations at a variety of geographic scales, and (3) provide transparent access to the methodologies, assumptions, data sources, and species-specific correction factors used by Partners in Flight to create these estimates.